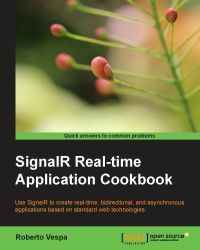 I was quite surprised to receive a review request for a book that was released more than a year ago: SignalR Real-time Application Cookbook by Roberto Vespa. Although I already bought this book some time ago, I somehow never got around to actually reading it. This review request was just the push I needed, to finally do it. If you have read any of my previous reviews, you might already know, that I'm not really a fan of the cookbook format of books. This one suffers from the exact symptoms which make me dislike most of such books: a significant part of the book is dealing with non-related technicalities, needed to make the recipes work, and too much of the on-topic content gets repeated over and over again, even though the author is trying to minimize that. In spite of that, this is still a great first book on SignalR to read. It manages to cover all of key SignalR topics, and doesn't stop at the most common scenarios, although most of the time is spent on them, as it should be. You won't learn only about web clients and hosting the server in IIS, but also about .NET based clients and self-hosting. It doesn't stop at the high-level hub API, but explains low-level connections as well. It doesn't ignore the more advanced topics either: authorization, dependency injection, backplanes and extensibility. The last couple of recipes were the ones I liked the most; every one of them applying SignalR to a different real-world scenario. It was great to see examples going beyond the usual real-time chat. Their real value should be in giving the reader additional ideas, how to take advantage of the framework in less obvious cases. Still, don't expect the book to give you a really in-depth look at SignalR. It mostly focuses on using it, not understanding its internals. Different transport strategies are only briefly touched, and the author doesn't even attempt to go into explaining the "magic" that's happening behind the curtains.